Tuesday March 29th 1898 I got the ironing done before noon and was over to Emmas a little while after dinner. come back did mending and practices some. Lee's birthday. 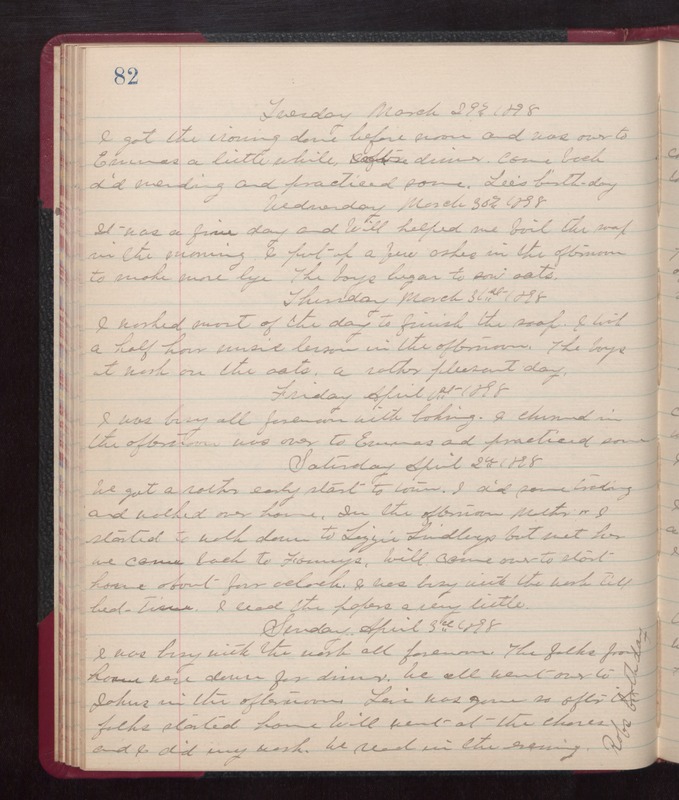 Wednesday March 30th 1898 It was a fine day and Will helped me boil the soap in the morning. I put up a few ashes in the afternoon to make more lye. The boys began to sow oats. Thursday March 31st 1898 I worked most of the day to finish the soap. I took a half hour music lesson in the afternoon. The boys at work on the oats. a rather pleasant day. Friday April 1st 1898 I was buys all forenoon with baking. I churned in the afternoon, was over to Emmas and practiced some. Saturday April 2nd 1898 We got a rather early start to town. I did some trading and walked over home. In the afternoon Mother & I started to walk down to Lizzie Lindleys but met her we came back to Fannys. Will came over to start home about four oclock. I was busy with the work till bed-time. I read the papers a very little. Sunday April 3rd 1898 I was busy with the work all forenoon. The folks from home were down for dinner. We all went over to Johns in the afternoon. Levi was gone so after the folks started home Will went at the chores and I did my work. We read in the evening. Robs birthday.